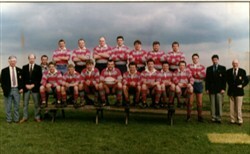 Olney RFC 1st XV team photograph season 1995 – 1996. Players – Back row: S. Howkins, C. Day, J. McLoughlin, T. Simmons, B. Elderton, J. Holmes, N. Deighton. Front row: D. Baseley, D. King, C. Williams, J. Page, T. Salsbury (Captain), S. Williams, J. Fossy, O. Shaw, A. Doyle, I. Bennett. Plus officers including: I. Cox (Club Captain), J. Brock (Coach), L. Fairey (President).